DMG Productions uncovers recent advances in blockchain technology and cryptocurrencies. The award-winning producers of Innovations w/Ed Begley Jr., will explore the latest advances in cryptocurrency. This episode is slated to air first quarter 2018 on FOX Business. Check your local listings for more information. Cryptocurrencies differ measurably from conventional equities or forex as a subject of investment analysis. An assessment of the viability of a new currency or token typically requires an evaluation of an open source software project, a proposed model of a decentralized market, a design for new forms of economic incentives and behavior, and other considerations such as the long-term viability of the blockchain or protocol stack within which the token resides. In combination, these differences create an investment challenge that defies the simple application of existing investment information tools, which are centered on the analysis of balance sheets, P&L statements, and commercial transactions under GAAP accounting as well as projections of factors such as market share, sales and profitability into the future. This segment of Innovations will take a behind-the-scenes look at the current state of cryptocurrencies, and will educate the public about the Pareto Network – a service for incentivizing the generation and sharing of information about tradable opportunities in cryptocurrencies and related assets. 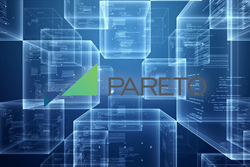 Designed to elevate information about market inefficiencies and promote more accurate price discovery, the Pareto Network hopes to steer the markets toward the correct pricing of these assets. "We are excited to share our story with Innovations,” said Eric Lamison-White, Co-founder of Pareto Network. “Blockchain technology is poised to be one of the greatest disruptive technologies of our times and cryptocurrencies are a central driver of this change." The Pareto Network is the first peer to peer financial content marketplace. It connects providers of financial information in the global cryptocurrency space with investors, providing foresight into market inefficiencies and opportunities. Content creators are compensated for sharing actionable financial information that benefits participants in the network. When Pareto token owners compensate content creators, their ranking increases which gives them faster access to more actionable information. For more information, visit: http://www.pareto.network. For more information visit http://www.InnovationsTelevision.com or call (866) 496-4065.